Nikita Kucherov is in a similar place as last season atop the scoring leaders in the NHL and he’s performing at such a dominant level we should perhaps be comparing him to the best centres in the game rather than the best wingers. 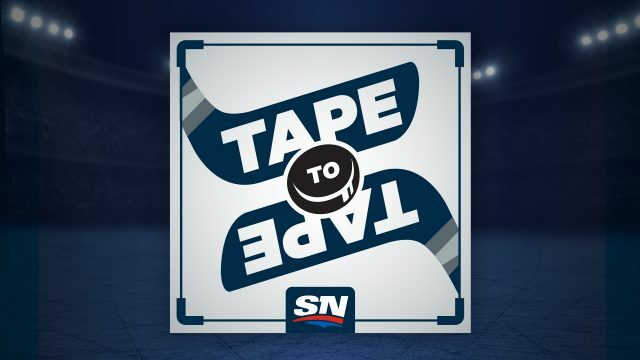 And in trade deadline talk, this week’s question from Steve Dangle focuses on Micheal Ferland, who is having an excellent season in Carolina’s struggling offence. But how much value would he actually bring to an acquiring team as the expected price to get him is fairly high? That and more in this week’s column. A year ago today, Nikita Kucherov had 27 goals and 60 points in 44 games to lead the NHL in scoring. This year, he’s leading the league again, but with 22 goals and 75 points in 47 games. Last season Kucherov slowed down a bit and finished third in scoring behind Connor McDavid and Claude Giroux. After being one of the leading Hart Trophy candidates all season long, he was written off as the regular season came to a close and wasn’t even a finalist for the award. I was among those who were against Kucherov winning the Hart. My argument essentially boiled down to the fact his on-ice performance relative to his teammates was not at the level of other Hart candidates at 5-on-5. However, when I had more time to crunch data over the summer I started to wonder if I was taking too simple of a look at it. That’s because, based on all that data, he actually scored higher than Taylor Hall did in the player ranking project if you combine left and right wingers. It was the second straight season Kucherov ranked far and away as the best winger in the NHL by my calculations, and with a third season now unfolding in which he’s pushing for a scoring title, I’m starting to wonder if he should be compared more to the game’s best centres than the game’s best wingers. 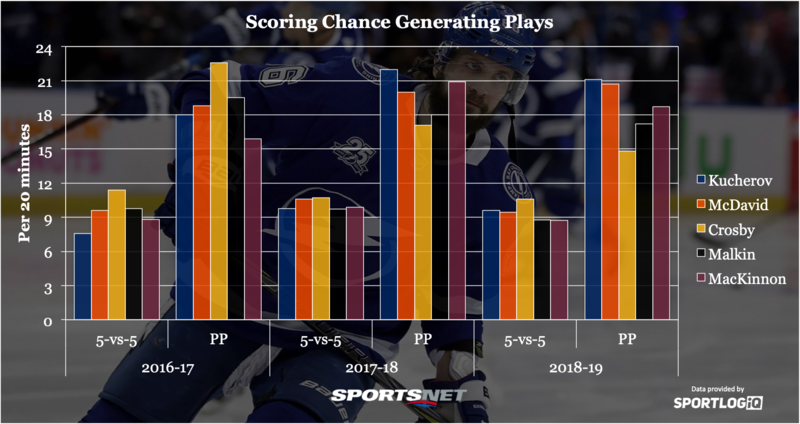 Just for simple illustration, let’s look at Kucherov over the past three seasons in scoring chances created compared to the best centres in the game. In terms of straight up manufacturing offence for his teammates, Kucherov is right in the same wheelhouse as the top centres in the league over the past two years, slightly behind Crosby and McDavid at 5-on-5, but more impressive than any of them on the power play. Obviously centres are responsible for more than just creating offence, but when we’re trying to attribute value to what Kucherov does, I do think it’s worthwhile to know that he is as big a part of the offence for his team as any of the best centres in the world. As good as we think Kucherov is, he’s even better than that. 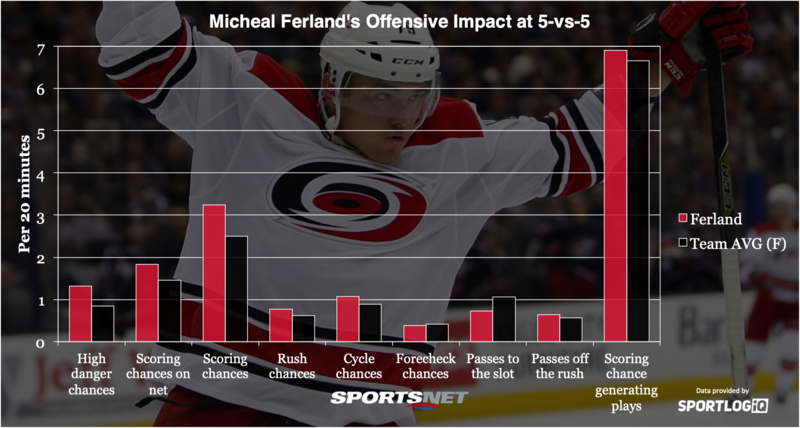 After a breakout season last year while riding shotgun with Sean Monahan and Johnny Gaudreau, Ferland is playing just as well on a Carolina team that has very few players living up to their expected level of offensive production. Ferland is one of the few Hurricanes players this season who has scored at the expected rate or better based on shot volume and location, which makes him stand out from the rest. He also has the distinction of playing with a physical edge, which teams also clearly love. On pace for 25 goals and 48 points, Ferland isn’t necessarily a game breaker, but that type of production is fringe first line level for a winger in today’s NHL. So he brings a unique mix of offensive production and physicality that all teams crave, but let’s get into the data: does he truly stand out from the pack on the Canes? Carolina produces a lot of chances and Ferland is solidly ahead of team average — he ranks second to only Andrei Svechnikov in high danger chances. Ferland has an uncanny ability to get chances near the net, so it might be slightly surprising that he has fewer opportunities off the forecheck than his average teammate. The problem for him there is he’s usually the one doing the forechecking, so we won’t hold it against him. In fact, his offensive zone puck battle win rate of 40 per cent is the highest on the Hurricanes by nearly five percentage points. What I like about Ferland is his versatility as a shooter. Usually when a team says they need to get tougher I cringe a little, but Ferland actually makes a lot of sense in this regard. He’s an involved player off the rush who gets more chances and makes more passes than the average Hurricanes forward. He’s excellent off the cycle, too, where he gets a good portion of his chances with pre-shot movement involved. He’s not adept at getting the puck into the slot for his teammates to shoot, but he creates more scoring chances for his teammates than the average Hurricane, so I would say his playmaking is decent. There might be a bit too much hype around Ferland at the moment, but he strikes me as a player who won’t disappoint even if the price is high. • Every team that trades Nino Niederreiter seems determined to lose the deal by a landslide. I had him ranked as the 13th-best right winger in the league coming into this season, whereas Victor Rask ranked 77th among centres. That’s a huge gap. • What makes the Habs’ power play so bad? For starters, only 50.3 per cent of their shot attempts are from the slot, which ranks 24th in the league. But they also have extreme problems getting their shot attempts from the slot on net. Only 51.7 per cent of their slot shot attempts hit the target and only the Devils are worse at that. The whole scheme needs to be reworked. • All season I’ve been saying the Sabres and Ducks were going to fall off, but I expected it to be more gradual than this. Buffalo has been losing all the one-goal games they were winning early, and the Ducks… well that’s just been ugly. • Speaking of the Ducks, there were rumours in the off-season that Ryan Kesler would sit out the season – and maybe he should have? Six points in 44 games is less than half of his career-low production from last season, he’s generating scoring chances at the rate of a fourth-liner and getting caved in defensively. His Corsi may look okay at 47 per cent, but his high danger chance and pass to the slot differentials are both sub-40 per cent.